Professional design team. Providing the most suitable, economical solutions. 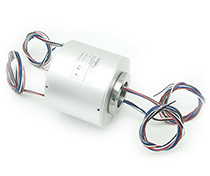 We offer a range of slip ring product lines with a variety of options to meet your needs. 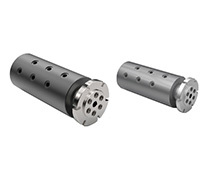 Single and multi-passage rotary unions,the medium can be hydraulic,penumetic, etc. A Slip Ring Unit is an electromechanical part which allows transfer power and electrical signals from a stationary interface to a rotating structure. Slip Rings can be used in any electromechanical system which requires unrestrained, intermittent or continuous rotation while transmitting power and/or data. It can improve mechanical performance, simplify system operation and eliminate damage-prone wires fixed/hanging from moveable joints. How Does Slip Ring Works? The slip rings composed of rotor and stator, also includes brush block, brushes, bearing, conductive ring. In general, the brushes divided into three types: composite brushes, monofilament brushes, fiber brushes, the conductive ring fixed in the shaft, then the brushes contact the outside diameter of a rotating metal ring, as the ring turns, the power and the signal through the brush to the conductive ring making the connection. The brushes fixed in the brush block, and connect with the stator lead wire. The rotor lead wire connected with the metal ring. This rotation system is the best solutions for 360 degree unlimited motions. Want to know more about slip rings, click here. As well-known, in the electrical design process, the electric engineers will encounter problems winding wire while the mechanical parts unlimited continuous 360 degree rotation, this time, an electric rotating connector is needed. 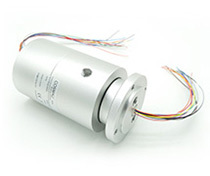 Slip rings can be used for any small voltage rotating body, PLC control, digital / analog video, digital audio, high frequency, EMF, thermocouple, Can-bus, Profibus, RS485, RS422, Ethernet, signal of sensor and power connection. The typical application includes security system, package equipment, cable reel, robotics, wind turbines, aerospace and a wide range of automation system. Cosmau Slip Ring is as reliable as any other electrical control or monitoring device using well established and proven designs. The transmission of signals is not a problem, we will design a structure according to the circuit characteristics, and consider the details to ensure the reliable transmission, for example the anti-interference, circuits layout and so on. The slip ring circuits are fiber brush contacts. Precious metals are used to improve data transmission of signal circuits. All units are tested before shipping out, this includes but is not limited to, continuity, insulation resistance, dielectric strength, torque and rotational tests. Electrically the circuits are capable of moderate fault levels and surges without detriment. The slip rings, brush gear and terminal designs are well proven. Regular and appropriate maintenance is paramount for the safety and service life of the slip ring. For more details, please contact us to get the manuals.